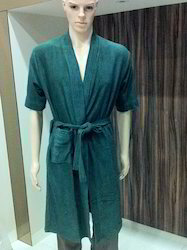 Our customers can avail Luxury Bathrobes from us. These bathrobes offered by us are stitched using premium quality fabrics, procured from certified vendors of the market. In addition to this, the offered range is inspected on various characteristics such as finishing and durability so as to ensure its tandem with the international quality norms and standards. We are able to offer a wide array of Bath Robe to respectable clients. The offered range of bath robes is widely acclaimed in the market for its breathable nature and anti-bacterial attribute. In addition to this, the offered range is designed utilizing premium grade cotton and allied fabrics, sourced from trustworthy vendors of the market. 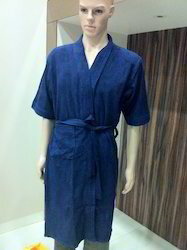 Owing to the rich experience and a competent team of experts, we are able to offer Cotton Bath Robe. The offered range is checked on number of characteristics so as to ensure its tandem with the benchmarks of quality. Furthermore, offered products are made utilizing high grade fabrics and modern machines in strict adherence with the highest quality norms and standards. We offer a wide range of Bath Robes with a distinctive style. Our Bath Robes are fabricated from the finest fabric and finished with exceptional detail. These Bath Robes are easily washable, comfortable to wear, perfectly cut and excellently stitched. Our range is also available in customized specifications and at the most affordable rates. 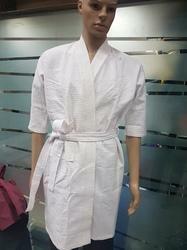 We are able to offer a wide array of GreenBath Robe to respectable clients. The offered range of bath robes is widely acclaimed in the market for its breathable nature and anti-bacterial attribute. In addition to this, the offered range is designed utilizing premium grade cotton and allied fabrics, sourced from trustworthy vendors of the market. Our organization is offering an extensive range ofMAROON BATH ROBEwhich are sleek, stylish and delicate. These are soft & comfortable to wear, yet look trendy and attractive. Our collection of women's spa uniforms is designed at par with the latest fashion trends, which provide an elegant look to the wearer.